The entire U.S. equity market is now processed in a single NovaTick appliance reducing total cost of ownership, while further lowering latency. NEW YORK, LONDON, PARIS- OCT. 16, 2017 – NovaSparks™, the leading field programmable gate array (FPGA) market data company, today announced that its pure FPGA ticker plant appliance, NovaTick, now processes the entire U.S. equity market in a single 2U appliance. 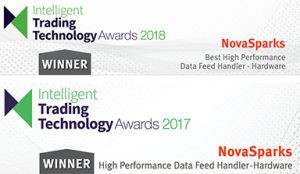 This achievement offers an important benefit to banks and trading firms that allows them to deploy pure FPGA feed-handlers in a simple and cost-effective manner. A single NovaTick 2U appliance now handles the entire instrument universe of the ten feeds from the main three exchange groups NASDAQ, BATS and NYSE, as well as the SIP feeds (UTP and CTA). The appliance’s average latency is 760 nanoseconds, measured wire-to-wire when using the Ethernet output. The latency remains below one microsecond at the 99.9 percentile, illustrating a level of determinism that only a pure FPGA solution can deliver. NovaTick is built on an FPGA-centric architecture, augmented with tightly integrated multi-core Intel processors to support non-latency sensitive tasks such as exchange recovery functions. NovaSparks’ ticker plant has a single application programming interface (API), which allows banks and trading firms to integrate additional feed-handlers quickly and effortlessly.